Have something in your mind you think would be cool or you'd like to be implemented, or you're gravely disappointed in some part of the group? This is the part where you can suggest things, every idea is welcomed and only not saying anything is bad one! None if the ideas are automatically implemented, and maybe not used exactly in the way it's presented, but from the silliest of ideas something awesome might be thought up. Speaking up is highly recommended, please tell all of your ideas! You could maybe add a F.A.Q. section, I'm sure you get a lot of repeat questions that could be put into a F.A.Q. Add a bit more prey options for hunting? Slots don't refresh; once a slot's been used, it's been used. The information about ranks and how many breeding slots you earn is also on Fate Points and Skill Points page, just more towards the bottom. I think if you post two breedings that would result in injure and then infertility you should be told on your first and then on the second the breeding just shouldnt be counted. This is assuming you post them one after the other though, which a lot of people do. Or even just adding the possibility of finding CR during activities anyway, I think that would be cool. A geno showoff area in the discord would be neat! Perhaps an item like colored contacts? They still carry their original eye color ofc, for breeding n such. Could be dropped from events or crafted. Maybe even multiple contact items for each color, to maybe add a bit more challenge w getting the color you want? Ok probably no one cares but I'll give a shot. I noticed that the weight and length in relation to the Kukuri's hip height are a bit off on common and priare kukus. The Common kukuri's height is roughly 1.5m to more than 2.0m, and the kuku's length goes from 4 m to 6m. The weight goes from 130 to 400 kg. If we compare them to the utharaptor (en.wikipedia.org/wiki/Utahrapt…) or to the dakota raptor (sauriangame.wikia.com/wiki/Dak…) they are both 1.5 m tall, but they weigh respectively 500kg(maybe less but still close) and 350kg (the lightest in in it's class)and their lenght is respectively 7 m and 5.5 m.
The Praire kuku's height goes from 2 m to 2.9 m.The lenght goes from 4.5 m to 7 m and the weight from 180 kg to 543 kg. 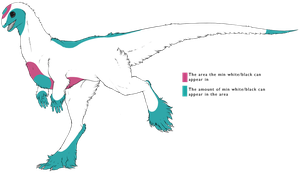 The praire kuku is most similar in height to the Allosaur, although that is where the similarities end. The Allosaur's length goes from 7.5m to 9.7m (en.wikipedia.org/wiki/Allosaur…) The Allosaur also has a weight ranging from a minimum of 700kg up to over 2000kg, with hollow bones at that. In conclusion, I would suggest to keep the Kukuri's heights invaried. Their lenghts should be modified extensively. The weight is what concernes me the most though; The common kukus should weigh at least a couple hundred kgs more, while the praire kuku, due to it's size, should weigh at least 500kg more. Joy's around in December, and she's Christmas/Solstice themed; and Romeo's around in February, and he's Valentines' Day themed; right? So, what if there were seasonal starters for the other even-numbered months: April, June, August and October? April could be a dove, April Fool's Day themed, maybe with the Clown marking and loads of fake "markings" applied with paint. June could be a rook, and also Solstice themed! Since Joy's the Winter Solstice, and the admins seem to mostly be in the Northern Hemisphere, June rook could be the Summer Solstice. Joy has Wisp and Calico so maybe he should have Rune and... uh... Koi? Crested? not sure what the counterpart of Calico is. August could be a dove, but other than that I'm finding it hard to figure out a possible theme for her... her month is opposite Romeo's, so something like Luminescent Jade with Fin horns (since those are kind of the counterparts of Iridescent Azure with Unicorn horn)? Now, I know you get a lot of suggestions, and most of them are even better than this one. I just can't get this silly thought out of my head. I keep thinking about it, over and over, even trying to design them in my mind. So basically I just thought "Aw, heck, drop it in the suggestion box." Platonic and/or familial prompts for bonding. Soul/lifemates aren't always romantic. Siblings or best friends would both be examples that would benefit from additional prompts. I'm sure there's a reason for the Divine Shop being open just once a year, but for the sake of players' finances, would the staff consider doing it twice a year? Once during the usual time, through the month of December, and once during June? That way, players don't have to worry about also affording Holiday Season gifts and end/beginning-of-year expenses. Thank you dear for reminding <3 Added! Maybe a rule would be good that would change over time? Something along the lines of "during November you're only allowed to post a design every third day"followed by "during December you're only allowed to post a design every second day?" Until it's back to one per day? This way the Design Approval wouldn't be flooded with designs from the same persons that have over 10 genos sitting and waiting every day, everything could sort of get back in line, the design approval admins (Great job by the way you guys! I already pray for your nerves! ;w would get some air inbetween and people would still get to throw their Kukuris in rather "fast". I think it'd be great if clothing items could help the sphinx mutated babies to be a bit hardier against injury and illness. (Not sure if they are actually more prone to getting sick on gathering trips or if it's just mine who is accident prone XD). Wouldn't need to be a big bonus or anything, especially for the small clothing blueprint, but even a small buff for the naked kiddos would give the items a bit more utility in game. Heck if armor could provide a small buff against injuries while doing activities, that'd make it a lot more useful for everyone while we wait on more expansive in-game applications for it. Would it be possible to make the Celestial rock guarantee at least 2 pups in a breeding? I see the celestial rock to considered way more valuable since it gives a chance to get a normal litter rather than the etherical, but this % of getting one pup make it still too similar to other one and really risky to breed still, people spend lot of money and whatever for one good breeding but many end up with one pup which is frustrating. I've noticed recently that many kukus have been becoming infertile due to overbreeding. That is fine, however one problem is that sometimes people who have worked hard for the slots to that kuku or paid money for them before the kuku became infertile can no longer use the slots. For example, I saw that someone was planning to breed a kuku that they bought a slot to ages ago, but they could not as he had gone infertile. There needs to either be some sort of compensation (so people trade the dead slot for Cr or something) or those slots should remain usable. A special training as a helper (Handicapped Handlers). Its not necessary, but you will get bonuses if their handicapped partner is drawn with their Kuku after the training is completed. You have to draw atleas three prompts before the HHT (Handicapped Handler Training) is aprooved and can the Kuku can be used as a helper. I have two suggestions actually. The first being a one time use potion that would allow you to breed infertile kuku's, and gain healthy pups. To avoid overuse it could be a very rare item, or only be available during certain months of the year. I just always see infurtle pups with some desirable genetics, and it's a bummer they can't be used at least in some way. The second one being like a scroll of modification or rebirth, but it allows you to add a new marking to your Kukuri that is dosen't already have. Maybe you've found the perfect geno, but it's missing that one marking that would give it that little extra something that you've been looking for. Finding the perfect geno can be a frustrating endeavor sometimes, so the ability to add one marking would be cool. It should be limited to undesigned genos, or imports without training or rank to keep people from changing their current Kuku's. I don't know if this is a thing you usually do or don't, but I think you should double check import corrections with other design approvers before posting them... In two of the three attempts on my Kukuri it always says "Sorry we didn't catch this earlier" and I'm stuck waiting a week or more everytime I correct it just to get another comment saying I have to change something that wasn't written before. Maybe a potion that increases the chance of an Albino?? Very minor, but on the Error Corrections page, instead of only having big bold links to page errors and import errors it would be good to add "bank errors" (as these are relatively common) and maybe "other errors"
I was thinking it would be neat to have all the marking guides (those things ^) in the import template psd's. A lot of designs get knocked back from design approval purely because markings are outside the allowed range and being able to overlay those when designing may help. The stash files are smaller than the psd otherwise I'd just copy them over and make my own, so if someone still had the original size files it would be a handy tool to have. I read that LittleOwlette already commented this, but I was thinking about it before . . .
what if there was a starter design contest?!?!?! So with Romeo having to sit on the bench, I expect something similar to happen to Joy soon enough, and for fun I said 'why not replace Winter's Joy with Krampus?" XD an ebon/raven mini to replace velvet beeb Joy?